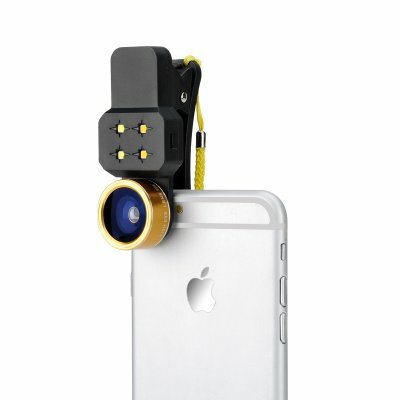 Successfully Added Universal 4 in 1 Phone Lens Kit- 198 Degree Fisheye Lens, 15X Macro Lens, 0.4x Wide Angle Lens, 4 LED Lights (Gold) to your Shopping Cart. Get just the effect you are looking for by using a macro, fisheye, wide angle or 15xmacro lens. Take your mobile photography to the next level with a nice set of 3 lenses + LED light for your smartphone. Compatible with most smartphones, the lens kit is a great way to make your mobile pics frame-worthy. Think about it: how often do you actually have a professional DSLR ready to snap a picture as you are taking a walk outside and see something funny, or want to capture a stunning sunset? Let’s face it - mobile photography has become one of our main pastimes and we naturally reach for our iPhones or Androids when a picture-worthy moment comes in sight. Unfortunately, no matter how much better our smartphone cameras have become, they are still not quite there to offer professional-looking shots. Unless, that is, you have the necessary equipment. This 4-in-1 universal mobile photography kit comes with all you need to take your photos to that next level. You will have 3 lenses in your arsenal: a wide angle lens for stunning panoramic images and great detaila 198 degree fish eye lens is a real selfie master, letting you focus on you the subject while getting all the beautiful scenery in the background and the marco lens will let you explore the microscopic world. What's more, you will also have 4 LED lights to guarantee great lighting for your photos day or night. The Universal 4 in 1 Phone Lens Kit comes with a 12 months warranty, brought to you by the leader in electronic devices as well as wholesale phone lens kits..